Before you read this, check out the itinerary we made before we left. Arrived in Frankfurt at 7:30 a.m. and drove to Wiesbaden where we stayed at the Holiday Inn Crowne Plaza. After a quick nap we drove to Russelsheim and Sarah visited Opel. Jason ventured out on his own in Wiesbaden for a German hair cut. In the evening we met with our friends John and Linda Capp and their daughters, Jessica and Melanie. We had a wonderful evening visiting the Weisbaden Christmas market, drinking gluhwien and visiting the Capps. Our morning started with Jason sneaking over to one of the bakeries and surprising me with a delicious breakfast of pastries and colored hard boiled eggs. 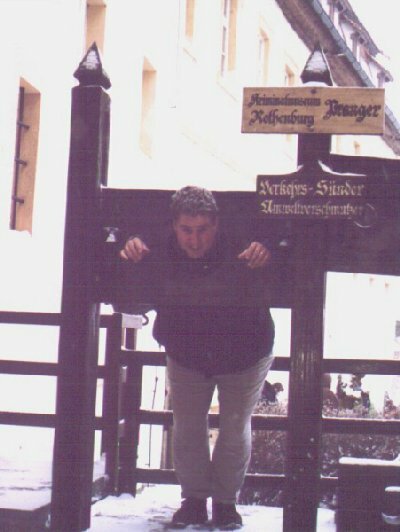 We left Wiesbaden and drove to Rothenburg ob der Tauber and checked into the Hotel Eisenhut. Rothenburg ob der Tauber is a medieval walled city that has been restored and is one of our favorite places to visit. The Eisenhut is a beautiful hotel comprised of four patrician's houses from the 12th century. The view from our room was lovely. 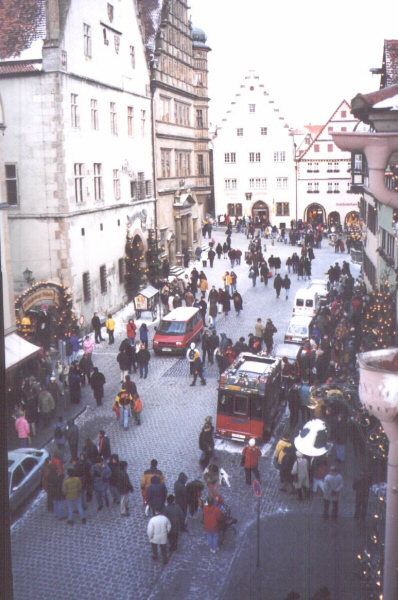 We walked around town and visited the Rothenburg Christmas Market. Our evening meal at the hotel was a traditional Franconian style dinner. (Needless to say, sausage was the main ingredient.) After dinner we walked around town which was very quiet after all the day time tourists had left. We also visited the local pubs. Today we drove to Nurnburg and visited the town Christmas market. 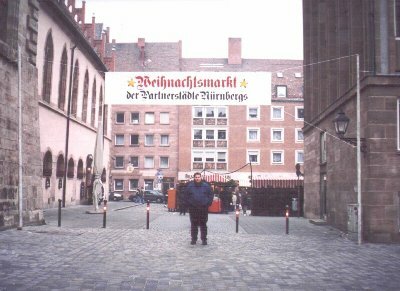 Nurnburg has the largest Christmas Market in Germany. We spent the entire afternoon visiting all the booths and buying Christmas gifts. The gluhwein was the best here! In the evening we listened to a Gospel choir concert in the town center and then it was back to Rothenburg for a delicious gourmet dinner at the Eisenhut. 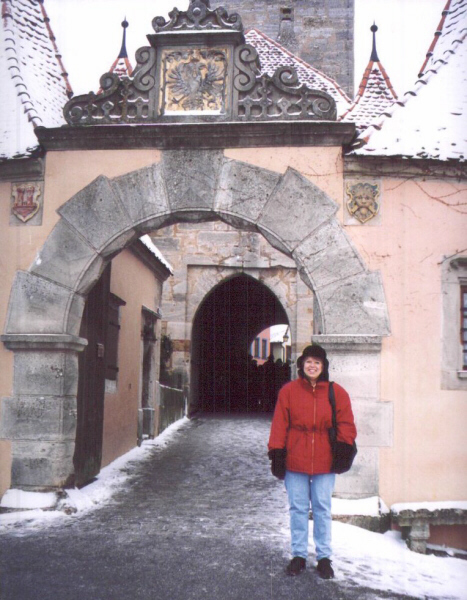 A walk around the snow covered streets of Rothenburg completing another perfect day. 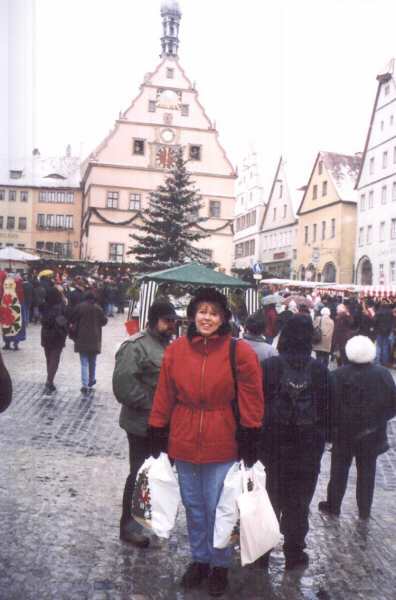 The entire day was spent in Rothenburg buying Christmas gifts and treats. 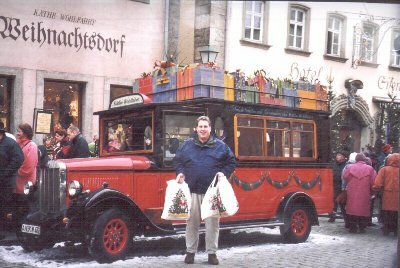 We saw the Kathe Wolfart car on our first visit to Rothenburg and now it was Jason's turn for a picture in front of it. After we finally put the credit cards away we visited the Museum of Crime and Punishment. Jason enjoyed this more than I did, but as you can see by the photo he paid for it! After our trip to the museum we walked around the city wall. 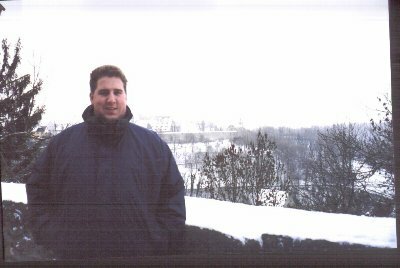 The view of the snow covered valley was breathtaking. In the evening we went on a horse and carriage ride around the town. We then went to the Rothenburg cybercafe - we couldn't stay away from computers any longer! In the morning we made a few more Christmas present purchases and then packed up and checked out of the Eisenhut. We had to navigate through masses of people shopping to drive out of town. The snow had finally started. 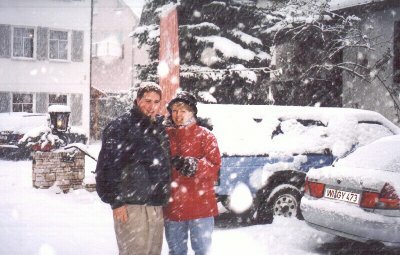 Jason got his wish - snow in Germany. 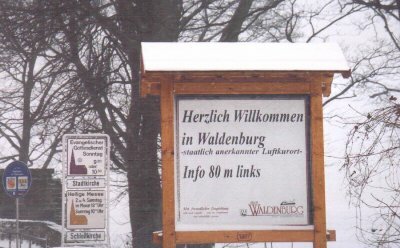 On our way to our next hotel we drove through Waldenburg. This was a special to Sarah because her family is from Waldenburg, Michigan! 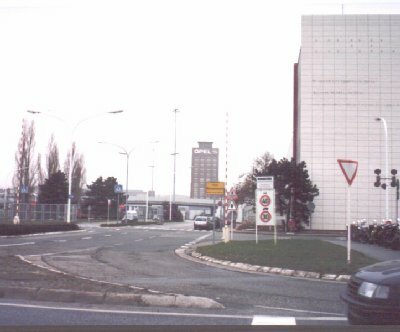 After a brief stop in Waldenburg we drove to Stuttgart and saw the DaimlerChrysler and Bosch headquarters. Then it was onto our hotel in Stuttgart-Plieningen - the Romantik Hotel Traube. It was a quaint hotel in a lovely quiet town. We woke up to about twelve inches of snow! 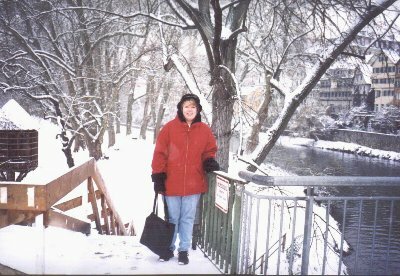 After breakfast we drove to Tubingen and enjoyed the beautiful scenery with snow covered trees and towns. 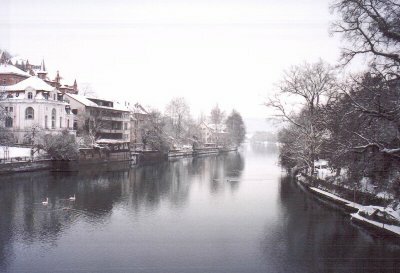 We spent the day walking through Tubingen and along the Neckar River. Yes, there was more shopping. It was a slow drive on the autobahn due to all the snow. Driving slow on the autobahn is very unusual! Today we drove to Pforzheim, a busy industrial city and picked up a few more souvenirs. 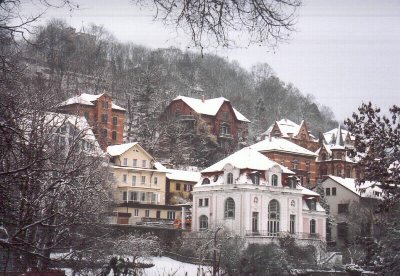 Our next stop was Baden-Baden. We revisited some of our favorite places from our last trip to Baden-Baden. Then we returned to the Hotel Traube for another delicious gourmet dinner. Departed Plieningen and drove to Frankfurt to catch a train to Amsterdam. The train went along the Rhine and we were able to see some of our favorite castles from our stay in Bacharach. We even successfully changed trains in Koln and continued on to Amsterdam. 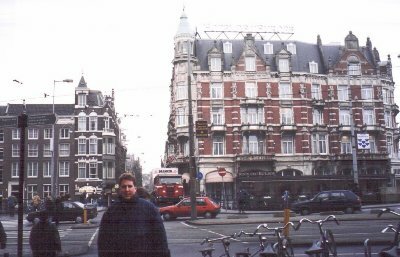 In Amsterdam we stayed at the Hotel De L'Europe. In the evening we walked around town and had dinner at an Indonesian restaurant. 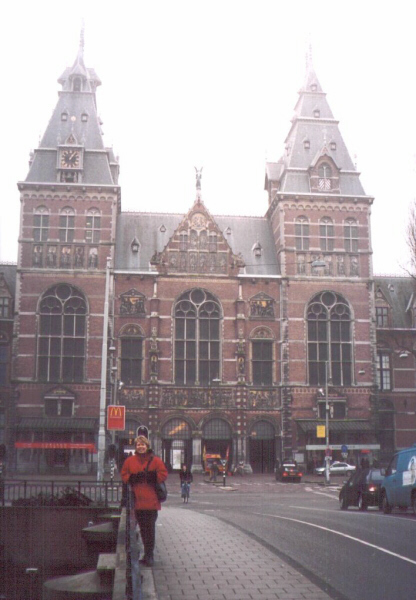 In the morning we walked around Amsterdam and checked out some of the "popular tourist attractions". 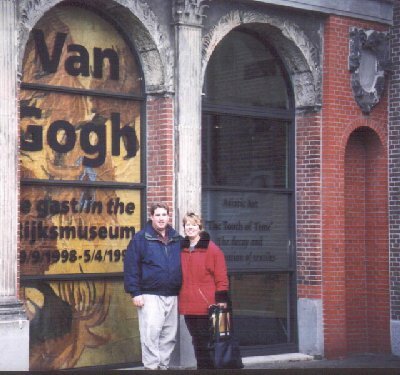 We visited the Rijksmuseum which was hosting the Van Gogh exhibit. What a thrill is was to see the masterpieces in the exhibit! 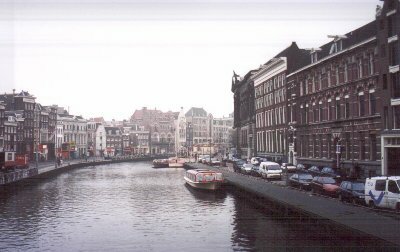 As we walked back to the hotel we stopped in a café, checked out the canals and then walked through the flower market. There were so many beautiful flowers! I wanted to bring them all home. It was time to return home . . . took another walk through the flower market and stopped in a café before we finished packing. Then it was time to take a taxi to the airport and fly home. Even the flight was great - we were able to get seats in First Class. Wow! That was how we were meant to fly! We arrived home safe and sound with loads of Christmas gifts. Another fantastic vacation thanks to Jason's excellent planning. The memories will last forever!